"Delian" redirects here. For other uses, see Delyan. For the band, see Delian League (band). Delian League, before the Peloponnesian War in 431 BC. The Delian League, founded in 477 BC, was an association of Greek city-states, members numbering between 150 173, to 330  under the leadership of Athens, whose purpose was to continue fighting the Persian Empire after the Greek victory in the Battle of Plataea at the end of the Second Persian invasion of Greece. The League's modern name derives from its official meeting place, the island of Delos, where congresses were held in the temple and where the treasury stood until, in a symbolic gesture, Pericles moved it to Athens in 454 BC. Shortly after its inception, Athens began to use the League's navy for its own purposes. This behavior frequently led to conflict between Athens and the less powerful members of the League. By 431 BC, Athens' heavy-handed control of the Delian League prompted the outbreak of the Peloponnesian War; the League was dissolved upon the war's conclusion in 404 BC under the direction of Lysander, the Spartan commander. The Greco-Persian Wars had their roots in the conquest of the Greek cities of Asia Minor, and particularly Ionia, by the Achaemenid Persian Empire of Cyrus the Great shortly after 550 BC. The Persians found the Ionians difficult to rule, eventually settling for sponsoring a tyrant in each Ionian city. While Greek states had in the past often been ruled by tyrants, this was a form of arbitrary government that was on the decline. By 500 BC, Ionia appears to have been ripe for rebellion against these Persian clients. The simmering tension finally broke into open revolt due to the actions of the tyrant of Miletus, Aristagoras. Attempting to save himself after a disastrous Persian-sponsored expedition in 499 BC, Aristagoras chose to declare Miletus a democracy. This triggered similar revolutions across Ionia, extending to Doris and Aeolis, beginning the Ionian Revolt. The Greek states of Athens and Eretria allowed themselves to be drawn into this conflict by Aristagoras, and during their only campaigning season (498 BC) they contributed to the capture and burning of the Persian regional capital of Sardis. After this, the Ionian revolt carried on (without further outside aid) for a further five years, until it was finally completely crushed by the Persians. However, in a decision of great historic significance, the Persian king Darius the Great decided that, despite successfully subduing the revolt, there remained the unfinished business of exacting punishment on Athens and Eretria for supporting the revolt. The Ionian revolt had severely threatened the stability of Darius's empire, and the states of mainland Greece would continue to threaten that stability unless dealt with. Darius thus began to contemplate the complete conquest of Greece, beginning with the destruction of Athens and Eretria. In the next two decades there would be two Persian invasions of Greece, occasioning, thanks to Greek historians, some of the most famous battles in history. During the first invasion, Thrace, Macedon and the Aegean Islands were added to the Persian Empire, and Eretria was duly destroyed. However, the invasion ended in 490 BC with the decisive Athenian victory at the Battle of Marathon. Between the two invasions, Darius died, and responsibility for the war passed to his son Xerxes I.
Xerxes then personally led a second Persian invasion of Greece in 480 BC, taking an enormous (although oft-exaggerated) army and navy to Greece. Those Greeks who chose to resist (the 'Allies') were defeated in the twin simultaneous battles of Thermopylae on land and Artemisium at sea. All of Greece except the Peloponnesus thus having fallen into Persian hands, the Persians then seeking to destroy the Allied navy once and for all, suffered a decisive defeat at the Battle of Salamis. The following year, 479 BC, the Allies assembled the largest Greek army yet seen and defeated the Persian invasion force at the Battle of Plataea, ending the invasion and the threat to Greece. The Allied fleet defeated the remnants of the Persian fleet in the Battle of Mycale near the islands of Salamis—on the same day as Plataea, according to tradition. This action marks the end of the Persian invasion, and the beginning of the next phase in the Greco-Persian wars, the Greek counterattack. After Mycale, the Greek cities of Asia Minor again revolted, with the Persians now powerless to stop them. The Allied fleet then sailed to the Thracian Chersonese, still held by the Persians, and besieged and captured the town of Sestos. The following year, 478 BC, the Allies sent a force to capture the city of Byzantion (modern day Istanbul). The siege was successful, but the behaviour of the Spartan general Pausanias alienated many of the Allies, and resulted in Pausanias's recall. After Byzantion, Sparta was eager to end its involvement in the war. The Spartans were of the view that, with the liberation of mainland Greece, and the Greek cities of Asia Minor, the war's purpose had already been reached. There was also perhaps a feeling that establishing long-term security for the Asian Greeks would prove impossible. In the aftermath of Mycale, the Spartan king Leotychides had proposed transplanting all the Greeks from Asia Minor to Europe as the only method of permanently freeing them from Persian dominion. Xanthippus, the Athenian commander at Mycale, had furiously rejected this; the Ionian cities were originally Athenian colonies, and the Athenians, if no-one else, would protect the Ionians. This marked the point at which the leadership of the Greek alliance effectively passed to the Athenians. With the Spartan withdrawal after Byzantion, the leadership of the Athenians became explicit. The loose alliance of city states which had fought against Xerxes's invasion had been dominated by Sparta and the Peloponnesian league. With the withdrawal of these states, a congress was called on the holy island of Delos to institute a new alliance to continue the fight against the Persians; hence the modern designation "Delian League". According to Thucydides, the official aim of the League was to "avenge the wrongs they suffered by ravaging the territory of the king." In reality, this goal was divided into three main efforts—to prepare for future invasion, to seek revenge against Persia, and to organize a means of dividing spoils of war. The members were given a choice of either offering armed forces or paying a tax to the joint treasury; most states chose the tax. League members swore to have the same friends and enemies, and dropped ingots of iron into the sea to symbolize the permanence of their alliance. The Athenian politician Aristides would spend the rest of his life occupied in the affairs of the alliance, dying (according to Plutarch) a few years later in Pontus, whilst determining what the tax of new members was to be. In the first ten years of the league's existence, Cimon/Kimon forced Karystos in Euboea to join the league, conquered the island of Skyros and sent Athenian colonists there. The first member of the league to attempt to secede was the island of Naxos in c. 471 BC. After being defeated, Naxos is believed (based on similar, later revolts) to have been forced to tear down its walls, and lost its fleet and its vote in the League. In 465 BC, Athens founded the colony of Amphipolis on the Strymon river. Thasos, a member of the League, saw her interests in the mines of Mt. Pangaion threatened and defected from the League to Persia. She called to Sparta for assistance but was denied, as Sparta was facing the largest helot revolution in its history. An aftermath of the war was that Cimon was ostracised, and the relations between Athens and Sparta turned hostile. After a three-year siege, Thasos was recaptured and forced back into the League. The siege of Thasos marks the transformation of the Delian league from an alliance into, in the words of Thucydides, a hegemony. After two years Thasos surrendered to the Athenian leader Cimon. In result, the fortification walls of Thasos were torn down, their land and naval ships were confiscated by Athens. The mines of Thasos were also turned over to Athens, and they had to pay yearly tribute and fines. In 461 BC, Cimon was ostracized and was succeeded in his influence by democrats such as Ephialtes and Pericles. This signaled a complete change in Athenian foreign policy, neglecting the alliance with the Spartans and instead allying with her enemies, Argos and Thessaly. Megara deserted the Spartan-led Peloponnesian League and allied herself with Athens, allowing construction of a double line of walls across the Isthmus of Corinth and protecting Athens from attack from that quarter. 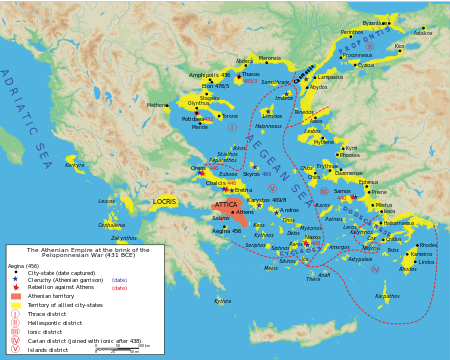 Around the same time, due to encouragement from influential speaker Themistocles, the Athenians also constructed the Long Walls connecting their city to the Piraeus, its port, making it effectively invulnerable to attack by land. In 454 BC, the Athenian general Pericles moved the Delian League's treasury from Delos to Athens, allegedly to keep it safe from Persia. However, Plutarch indicates that many of Pericles' rivals viewed the transfer to Athens as usurping monetary resources to fund elaborate building projects. Athens also switched from accepting ships, men and weapons as dues from league members, to only accepting money. The new treasury established in Athens was used for many purposes, not all relating to the defence of members of the league. It was from tribute paid to the league that Pericles set to building the Parthenon on the Acropolis, replacing an older temple, as well as many other non-defense related expenditures. The Delian League was turning from an alliance into an empire. War with the Persians continued. In 460 BC, Egypt revolted under local leaders the Hellenes called Inaros and Amyrtaeus, who requested aid from Athens. Pericles led 250 ships, originally intended to attack Cyprus, to their aid because it would further damage Persia. After four years, however, the Egyptian rebellion was defeated by the Achaemenid general Megabyzus, who captured the greater part of the Athenian forces. In fact, according to Isocrates, the Athenians and their allies lost some 20,000 men in the expedition. The remainder escaped to Cyrene and thence returned home. This was the Athenians' main (public) reason for moving the treasury of the League from Delos to Athens, further consolidating their control over the League. The Persians followed up their victory by sending a fleet to re-establish their control over Cyprus, and 200 ships were sent out to counter them under Cimon, who returned from ostracism in 451 BC. He died during the blockade of Citium, though the fleet won a double victory by land and sea over the Persians off Salamis, Cyprus. This battle was the last major one fought against the Persians. Many writers report that a peace treaty, known as the Peace of Callias, was formalized in 450 BC, but some writers believe that the treaty was a myth created later to inflate the stature of Athens. However, an understanding was definitely reached, enabling the Athenians to focus their attention on events in Greece proper. Soon, war with the Peloponnesians broke out. In 458 BC, the Athenians blockaded the island of Aegina, and simultaneously defended Megara from the Corinthians by sending out an army composed of those too young or old for regular military service. The following year, Sparta sent an army into Boeotia, reviving the power of Thebes in order to help hold the Athenians in check. Their return was blocked, and they resolved to march on Athens, where the Long Walls were not yet completed, winning a victory at the Battle of Tanagra. All this accomplished, however, was to allow them to return home via the Megarid. Two months later, the Athenians under Myronides invaded Boeotia, and winning the Battle of Oenophyta gained control of the whole country except Thebes. Reverses followed peace with Persia in 449 BC. The Battle of Coronea, in 447 BC, led to the abandonment of Boeotia. Euboea and Megara both revolted, and while the former was restored to its status as a tributary ally, the latter was a permanent loss. The Delian and Peloponnesian Leagues signed a peace treaty, which was set to endure for thirty years. It only lasted until 431 BC, when the Peloponnesian War broke out. Those who revolted unsuccessfully during the war saw the example made of the Mytilenians, the principal people on Lesbos. After an unsuccessful revolt, the Athenians ordered the death of the entire male population. After some thought, they rescinded this order, and only put to death the leading 1000 ringleaders of the revolt, and redistributed the land of the entire island to Athenian shareholders, who were sent out to reside on Lesbos. This type of treatment was not reserved solely for those who revolted. Thucydides documents the example of Melos, a small island, neutral in the war, though originally founded by Spartans. The Melians were offered a choice to join the Athenians, or be conquered. Choosing to resist, their town was besieged and conquered; the males were put to death and the women sold into slavery (see Melian dialogue). By 454, the Delian League could be fairly characterized as an Athenian Empire; at the start of the Peloponnesian War, only Chios and Lesbos were left to contribute ships, and these states were by now far too weak to secede without support. Lesbos tried to revolt first, and failed completely. Chios, the greatest and most powerful of the original members of the Delian League save Athens, was the last to revolt, and in the aftermath of the Syracusan Expedition enjoyed success for several years, inspiring all of Ionia to revolt. Athens was eventually still able to suppress these revolts. To further strengthen Athens' grip on its empire, Pericles in 450 BC began a policy of establishing kleruchiai—quasi-colonies that remained tied to Athens and which served as garrisons to maintain control of the League's vast territory. Furthermore, Pericles employed a number of offices to maintain Athens' empire: proxenoi, who fostered good relations between Athens and League members; episkopoi and archontes, who oversaw the collection of tribute; and hellenotamiai, who received the tribute on Athens' behalf. Athens' empire was not very stable and after only 27 years of war, the Spartans, aided by the Persians and internal strife, were able to defeat it. However, it did not remain defeated long. 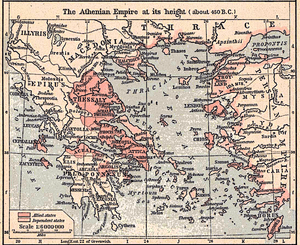 The Second Athenian Empire, a maritime self-defense league, was founded in 377 BC and was led by Athens. Athens would never recover the full extent of her power, and her enemies were now far stronger and more varied. ↑ Martin, Thomas (2001-08-11). Ancient Greece: From Prehistoric to Hellenistic Times. Yale University Press. ISBN 978-0-300-08493-1. ↑ The Complete Idiot's Guide to Ancient Greece By Eric D. Nelson, Susan K. Allard-Nelson, Susan K. Allard-Nelson. Page 197. ↑ Eva C. Keuls, The Reign of the Phallus: Sexual Politics in Ancient Athens (Berkeley: University of California Press) 1985:18. "Delian League". Encyclopædia Britannica. 7 (11th ed.). 1911.